At least 832 people lost their lives in Indonesia’s ongoing devastating tsunami, the country’s disaster agency said, as reported by the ANTARA news agency on Sunday. The government said it fears that the actual death toll might be up to thousands. Reuters reported that local hospitals are overwhelmed, and that rescue teams are working to free survivors from a destroyed hotel after a deadly tsunami hit the island of Sulawesi, where survivors were heard on Sunday calling for help from the destroyed Roa-Roa Hotel in Indonesia’s resort town of Palu. Officials estimate that up to 50 people could be trapped below the crumbled building. 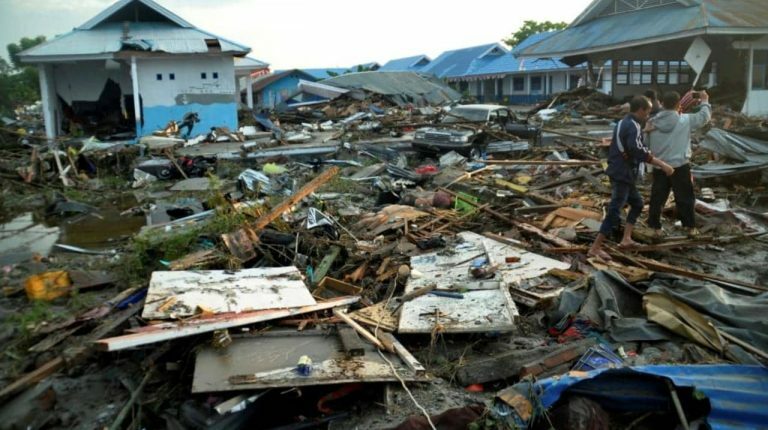 The Indonesian government is struggling to prepare a response to the destruction caused by the 7.5 magnitude earthquake, which triggered the tsunami on Friday. Palu’s Mutiara airport reopened late on Saturday, allowing military cargo planes to deliver relief supplies. Authorities are accepting humanitarian flights and limited commercial flights, but only to pilots who are able to land without relying on guidance from the ground.